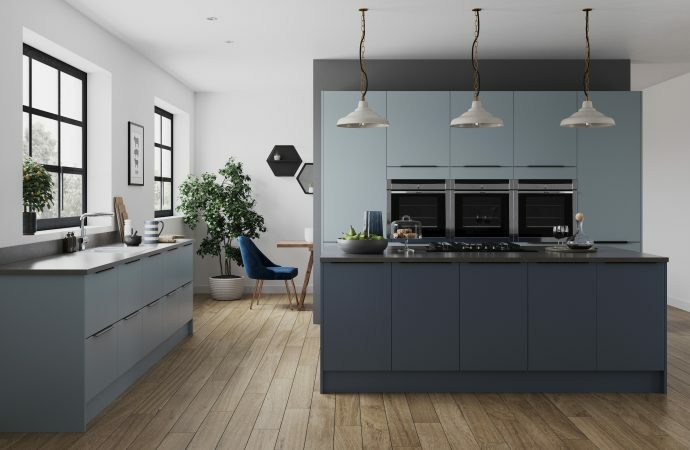 The hugely successful Trend Kitchens has been enhanced by the addition of new colours set to be popular in 2019. Three new designer colours have been added, Denim Blue, Smoke Blue and a blue/green Fjord Green. These new on trend colours are available in a flat slab MDF Supermatt finish for a contemporary look and the doors can be complemented with a range of new wrap over handles. The Supermatt finish provides a superior, luxurious and smooth solid colour, which is clear and crisp. This finish also benefits from being easy to keep clean because of its anti-fingerprint properties. More Dust Grey doors have also been introduced, across six different door styles and three price groups. Dust Grey is now available in a painted matt or gloss slab, matt and gloss painted handleless and a beaded and solid painted shaker. “The demand for grey in kitchens is still growing and our Dust Grey shade is the perfect choice for those who want something darker than light grey or lighter than Anthracite,” says Mark. When teamed with the European styled worktop UrbanTop range, retailers have even more opportunities to personalise designs and create spaces that are designed for living. Retailers have the added security that the Trend brand is part of the Mereway Group, a British based manufacturer that celebrated 30 successful years in 2016.